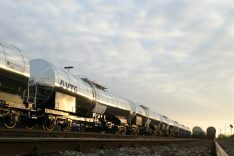 VTG Aktiengesellschaft, one of the leading wagon hire and rail logistics companies in Europe, has announced record operating results for the 2016 financial year despite a slight downturn in revenue. Based on newly released preliminary (unaudited) figures, operating profit (EBITDA) rose by 2.6 percent to EUR345.3 million (from EUR336.5 million in 2015), despite the fact that revenue declined by 4 percent to EUR986.9 million from EUR1,027.5 million. This positive development is due partly to the ongoing realisation of synergies following the acquisition of Swiss wagon leasing company AAE, but partly also to successful steps to improve efficiency in various Group divisions. Since profitability has improved sustainably in the wake of the AAE takeover, the Executive Board proposes that the dividend this year be increased from EUR0.50 to EUR0.75 per share.